We're here if you do get a blocked drain but using these simple tips should mean you don't need to call us that often! Heres a few things you can do to keep your drainage systems running as smoothly as possible! This handy guide will let you know some of the industry tips and tricks on how to keep drains clear, no matter how large or small your home. This may sound obvious, but by doing so, you'll be keeping your drains as clean as possible and reducing the chance of material getting lodged or stuck in the pipes that can cause a drain blockage. Many of the leading brands manufacture bleach and other cleaning products designed to be poured down sink drains, toilets and bath/shower units, so this method is relatively quick and cheap to utilise. 2.) Do not flush sanitary ware, nappies or baby wipes down the toilet! You'd be surprised just how many people put nappies down the toilet. This is one of the worst things you can flush down your toilet! Along with sanitary ware and baby wipes, nappies should be put in the bin. Otherwise, they'll very quickly block your drainage system and toilet and leave you with a problem that could be expensive and easily avoided! Even many of the leading 'toilet wipes' don't actually do what they say they will and quickly decompose. While they will eventually decompose, they'll take quite a while and could become a nuisance, its best not to chance it. How often do you fry something and pour the fat down the sink? We have all done it but whilst it's tempting to pour this down the sink as you clean the frying pan - don't! You might not think it will cause a problem, but it will. A build up of fat in your drainage system increases the likelihood of blocked drains and the problems that come with that. However, it's not only your drainage system that could be affected. Any oil, grease or fat that you pour down the kitchen sink could make its way into the sewer system and join up with other deposits from households in your area. It might not sound like much but if this is given the chance to build up in the sewers, it could (in the worst case scenario) lead to manholes spewing out sewage! For more information, visit uk.businessinsider.com/why-cant-you-pour-grease-down-the-drain-2014-8. While looking unpleasant, a build-up of hair, soap or limescale round your plughole can also lead to the clogging of your drainpipes over time too. Make sure that every week you remove any soap or hair that's built up and give your sink a comprehensive clean to reduce the likelihood of limescale building up too. It's important to try and keep all scissors, toys, toothbrushes and other items away from the toilet. This will prevent them being knocked into the toilet bowl by accident and potentially causing blockages if they're flushed away. You'd be surprised how many times we've found scissors in the drainage system! 6.) If you're feeling up to it, regularly check your manholes! If it's possible, we would advise that you regularly check your manholes every month or so. This will allow you to determine whether your drains are flowing freely or not and give you a clear indication about potential blockages and problem points. Monitoring your drainage system isn't just restricted to inside your home; it's important that you regularly check your guttering and drain gates too. Make sure that they're regularly checked and free from leaves, twigs and other foreign materials that could later cause build-up and other drainage problems. These are the seven top tips and tricks for keeping your drainage system as clear as possible. But the most important thing to note from all of this is just how vital it is that you regularly maintain your sinks, plugholes, toilets and drains. If you do so, you'll keep the chance of your drainage system blocking up as slim as possible. 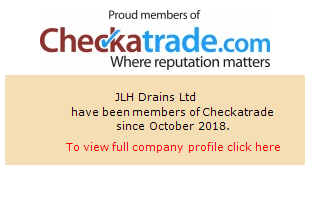 Don't worry though; if your drainage system does ever get blocked and starts causing you problems, simply call JLH Drains! We work throughout Medway, Kent and London, providing 24/7 emergency drainage repairs, so whatever the issue, we'll fix it quickly and effectively!